Sorry for the delay in updating my blog, I’ve been traveling and not had much in the way of internet connections of late. Right now I am back in Sulaymaniyah resting after several days of travel to several towns and villages about 80 to 100 kilometers north of here. The reason for our travels was to attend the wedding of a friend of CPT and have one of the team meet folks she knows before leaving for Canada and her husband. Another element of this was to introduce me to people that we have partnered with in the work the team has been engaged with. It was a beautiful wedding blended with traditional Kurdish and Western styles. She wore a white dress, he a tux and they cut a wonderful three tiered cake. Then the Kurdish dancing, music and reverie. About three hundred guests were there in the finest Kurdish attire. 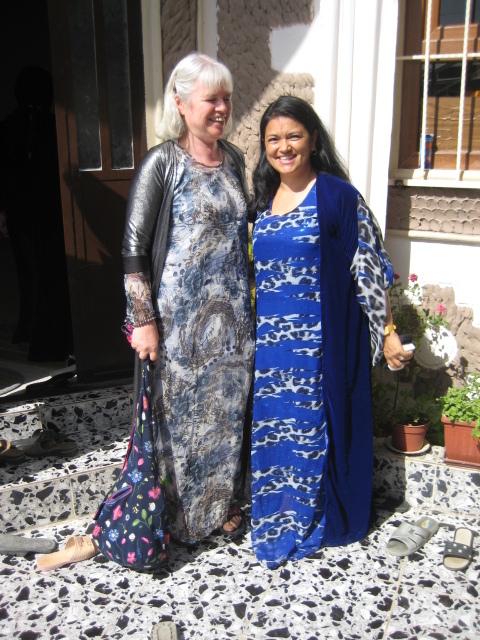 The photo below of two women are my team mates in the Kurdish dresses they wore to the celebration. Outside the enormous hall was the wide open spaces of Kurdistan with high mountains to the east and the visible peaks beyond of Iran about ten kilometers away. After the festivities we drove to a smaller town to the north and spent the night with a friend and then returned home to Suli on the bus. 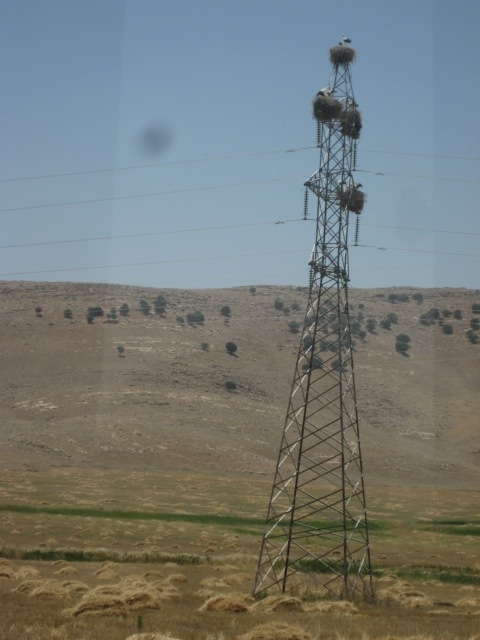 During the ride back I saw my first Storks nesting on the arms of the high tension electrical towers paralleling the highway, huge nests and REALLY big birds with enormous wingspans! The local name for the birds is, “Haji Luk Luk” which means, traveling=Haji and Luk Luk is the call they make. I also spotted my first Egyptian Vulture, fortunately I wasn’t lost in the desert and being circled by it. In Sulaymaniyah during the months of June there are periodic dust storms which kick up out of the southwest and fill the sky with superfine particals of dust turning the sky a light golden brown. Visibility can turn from a bright sunny day to complete darkness very quickly and the dust is literally everywhere and in everything. You taste it, smell it, feel it in your eyes and track it everywhere. I’ve really come to understand why washing one’s feet was considered so important and why it was considered a distasteful chore, its nasty but a necessity. 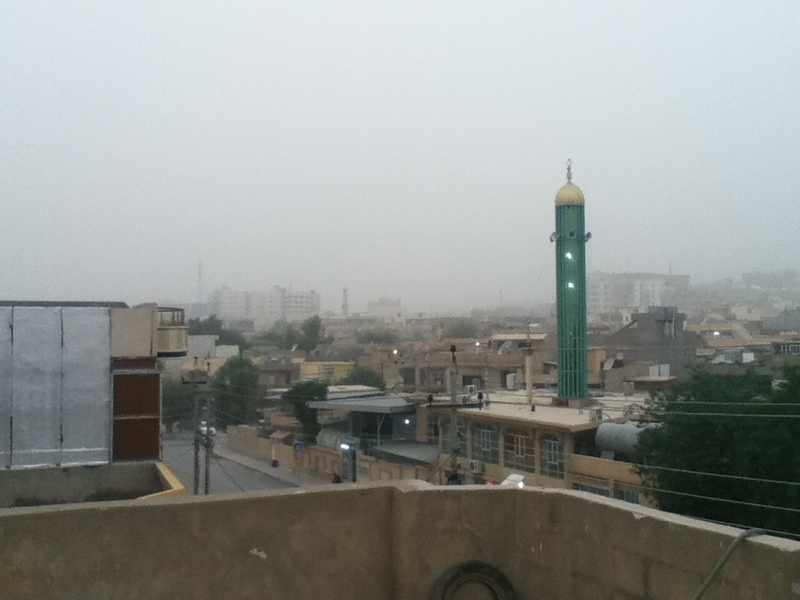 The image below is of the dust storm coming in from the roof top of the CPT office looking toward the Mosque across the street. Today was a RED letter day! I never imagined on the day of my baptism into the Mennonite Church that it would lead me to driving a Russian made Volga through the teeming streets and alleyways of Kurdistan but today was the day. (Get the pun? RED, former Soviet Union … Russian Volga? The cars name is the White Bear, also a play on words given the Russia was the Bear. Driving here is not too bad, mostly it is like driving in a shopping center parking lot, a lot of stopping and going and no discernible rules except direction of flow. The other drivers despite the cutting off of each other, slow speeds due to speed bumps which are EVERYWHERE, are very respectful, no honking of horns, or displays of road rage. Driving here so far is relatively easy despite the aging Russian car of the secret police of the Saddam era. Another great find is coffee shops! Absolutely the best place, artists, writers and such hanging out drinking espresso, who can complain? The photo below is Cafe 11 the home of the avant garde and people like me. Another aspect of local culture and religious faith that is soon approaching is Ramadan. I have much to learn about the Muslim faith and traditions and it seems I am fortunate to have many of the faithful who are willing to provide me with instruction on its beliefs and practice.